Bath kept pace with Premiership leaders Northampton with a bonus-point win at home to Exeter Chiefs. The visitors had led when Matt Jess took advantage of a Dominic Day fumble to run in from 40 yards, but Bath struck back through Horacio Agulla. Kyle Eastmond gave the hosts the lead before half-time but Jack Nowell drew Chiefs level at 14-14 after the break. 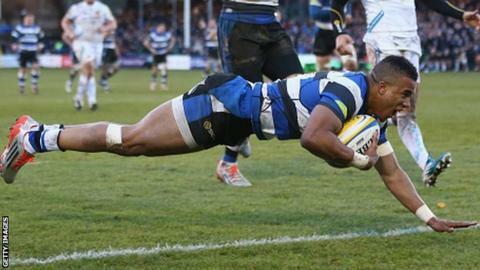 But Dave Attwood and Anthony Watson both ran over to give Bath a deserved - and eventually comfortable - victory. The result briefly sent Bath top of the table, but Northampton returned to the summit with victory over Harlequins. The hosts thought they had taken an early lead when Matt Banahan went over after good build-up play from Ford and Agulla, but Eastmond's pass to Banahan was correctly ruled to have been forward. Bath almost went ahead when Ford kicked a penalty wide from close to the halfway line, but instead it was the Chiefs who opened the scoring against the run of play. After a fumble from Day, Dean Mumm pounced and offloaded to Jess, who ran in from around 40 metres. Gareth Steenson converted to give Exeter a seven-point lead. However, it was not long before Bath responded through Argentine Agulla, who was well found by Eastmond before cutting inside and crossing, before George Ford tied the scores from the conversion. Bath's superior pace on the counter was clear and, after work from scrum-half Chris Cook, Eastmond strolled over their second try, leaving Ford with a simple kick from in front of the posts which gave the home side a seven-point lead at half-time. However, after the interval, Exeter capitalised on another Bath mistake to draw level. Ford's pass hit Steenson and Sam Hill collected the loose ball before sending a neat grubber kick towards the line, where Nowell slid in, just inside the flag. At that stage, Bath might have been worrying that it was not to be their day, but from then onwards, their dominance showed. First, Attwood touched over after a powerful Bath maul, and Ford converted before adding a further three points after a Chiefs knock on. Then the visitors went down to 14 men as Mitch Lees was penalised for coming in at the side, generating extra space which Watson duly exploited to run in a late dry and make the scoreline more reflective of the play. Bath: Watson; Agulla, Joseph, Eastmond, Banahan; Ford, Cook; Auterac, Webber, Thomas; Hooper (capt), Day; Garvey, Louw, Houston. Replacements: Batty, James, Wilson, Attwood, Fearns, Burgess, Young, Devoto. Exeter: Dollman; Nowell, Slade, Hill, Jess; Steenson, Chudley; Moon, Yeandle, Low; Mumm (capt), Welch; Ewers, Armand, Waldrom. Replacements: Cowan-Dickie, Rimmer, Francis, Lees, Horstmann, Thomas, Whitten, Vainikolo.